The head of the RIA Novosti Ukraine news agency in Kiev was detained by Ukraine's Security Service (SBU) on May 15, 2018, on charges of treason. Ukraine law enforcement accuses him of supporting the self-proclaimed people's republics of Donetsk and Lugansk. The arrest of the Russian-Ukrainian journalist has drawn condemnation from Russian politicians, who have demanded the immediate release of the journalist. The Russian Foreign Ministry sent notes of protests in relation with Vyshinsky's arrest, saying that the situation was "alarming." Russian Foreign Minister Sergei Lavrov has said that Kiev's actions against the RIA Novosti journalist were unacceptable. Commenting on the SBU's actions, Margarita Simonyan, editor-in-chief of Sputnik News, suggested that it was Kiev's "revenge" for the recently opened Crimea Bridge, though she noted that RIA Novosti Ukraine was actually not legally bound to Russian media company Rossiya Segodnya. Russia was not the only one concerned with the actions of the SBU. The Office of the United Nations High Commissioner for Human Rights also shared its concern on the detention of the journalist, citing increasing numbers of attacks against media professionals in Ukraine. Human Rights Watch Europe and Central Asia Division Deputy Director Rachel Denber called on the Ukrainian authorities to immediately clarify evidence to substantiate the criminal accusations against Vyshinsky. The Organization for Security and Co-operation in Europe (OSCE) representative on freedom of the media, Harlem Desir, urged Kiev to refrain from imposing "unnecessary limitations" on foreign journalists that impact the freedom of the press. 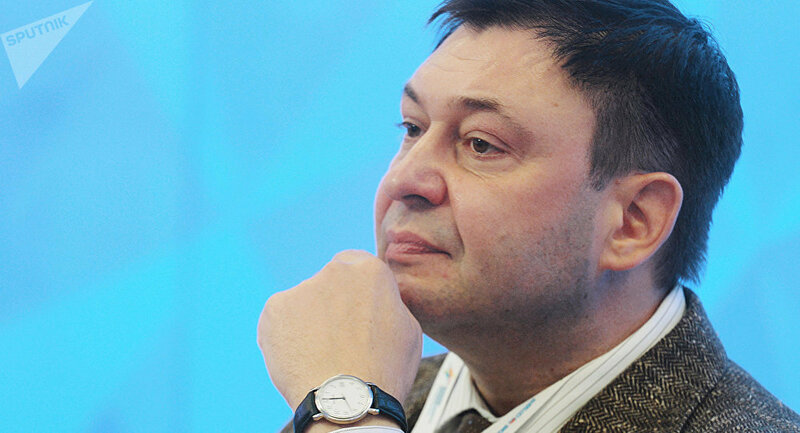 Nevertheless, calls from human rights organizations haven't stopped the Ukrainian court from giving Vyshinsky 60 days of detention without bail, despite the fact that the man can't live without proper medications due to health problems. When the end of this term was closing in, Ukrainian prosecutors announced that they allegedly found an FN Browning M1906 pistol in Vyshinsky's bank deposit cell and asked the court to prolong his detention up to September 13 based on charges of illegally acquiring weapon. The trial hasn't developed much in the 100 days that the journalist has spent in detention. On several occasions the trial was postponed, including once when the prosecution office for some reason failed to bring Vyshinsky to the court. In July, information surfaced that the Ukrainian authorities were ready to exchange the journalist along with 12 other detained Russians for Ukrainian prisoners in Russia, but so far an agreement on that hasn't been reached.